Video from the Spaghetti Dinner. Video from the Pool Party. Community Report #2 is the most recent report published by SaveNASchools. The report includes an Appendix with information provided by the district under the Right-to-Know law. (1) In 2009, elementary enrollment was 3,500 students and the district offered 158 classes. 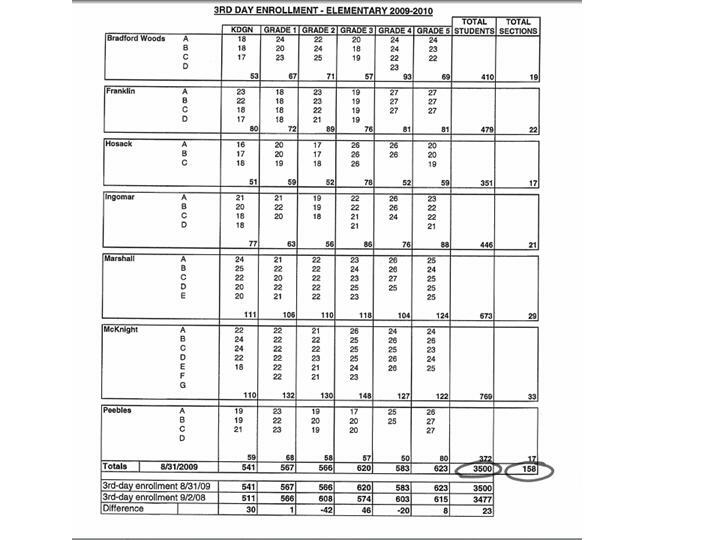 (2) In 2012, elementary enrollment was 3,530 students and the district only offered 145 classes. 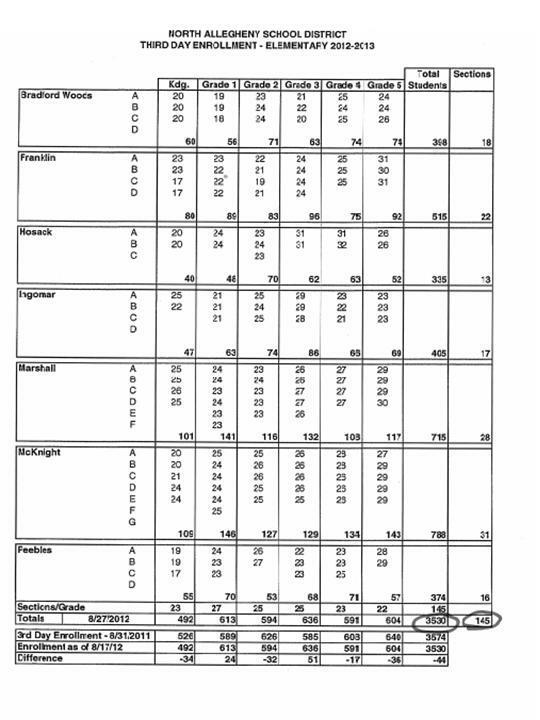 Because the district offered 13 fewer classes in 2012, empty classrooms and class sizes of 30+ exist across the district. If a building is closed, the district will be wed to a higher class size model. Based on the administration’s November 28, 2012 presentation, some buildings would only have one spare available to manage class size (instead of 3 spares). 2 of my sons goto McKnight. Oldest is in 4E. When school started they had 27 students now the class has increased to 31 students. He said the other sections have more than 30. I think one has 32. Not sure if my thinking is right but would it be better to add students to MCK so they’d be required by law to add a sections. I’m not concerned about the size of MCK, I’m concerned about the class sizes. The district maintains a class size guideline of 25 students for grades K-2 and 30 students for grades 3-5. However, these guidelines are not maximums and that is what allows the district to operate classes above 30. One of the arguments for closing a school that has been presented to us is that when the number of classrooms per building is higher, we can easily absorb additional children without class sizes increasing to the CRAZY large sizes that you are mentioning. The fact the McKnight is one of our larger elementary schools and that the addition of some children throughout the school year has caused your classrooms to exceed 30 can only lead me to believe that the administration is incorrect in their argument. With the closure of a school, class sizes in grades 3-5 will increase before the start of the school year. Thank you, Save NA Schools for the detailed Community Report #2. It doesn’t take a genius to see that our Superintendent & several Board members are biased, have several conflicts of interest with respect to BWE and their actions may actually border malfeasance. Are there any attorneys out there who might determine if this Board can be recalled under PA law if they proceed with a vote to close Peebles? Our neighbor, the North Hills School District, protects their students with published, strict policies regarding class size. The NASD also has class size guidelines, yet NA’s administration is currently allowing classes to go well above these supposed “guidelines”. And plans to close Peebles will jeopardize our class sizes even further. Why aren’t NA kids being offered the same class size protection as our neighboring school district? 1. When the building grade level average exceeds 20, one teaching assistant will be assigned to that grade level. 2. When the building grade level average exceeds 23, one teacher will replace the assigned teaching assistant for that grade level. 1. When the building grade level average exceeds 23, one teaching assistant will be assigned to that grade level. 2. When the building grade level average exceeds 25, one teacher will replace the assigned teaching assistant for that grade level. 1. When the building grade level average exceeds 25, one teaching assistant will be assigned to that grade level. 2. When the building grade level average exceeds 27, one teacher will replace the assigned teaching assistant for that grade level. “meeting at the Central Administration Center from 9 a.m. to 10:30 a.m. Both committee meetings will be combined meetings with the PTA/PTSO Task Force”…Wait…did that say “Task Force”??? North Hills seems to appreciate their parent community. Great analysis of the potential problems from closing Peebles. All this discussion about closing schools, larger class sizes, lack of rooms if the projected enrollment figures are underestimated, lack of transparency, unwillingness to use a task force for the analysis etc have got to be having an impact the public perception of NASD. If the perception of NASD was to decrease then less people would be wanting to purchase a home in NASD. This in turn would lower the normal appreciation of our home prices. For those of us who live in NASD and are planning to sell our homes in the next ten years this could be a large impact on home prices. This impact would be far larger than the $35/year or ten cents per day increase in taxes that would result keeping Peebles open. The $35/year is based on $210,000 home with a 1% increase in taxes.